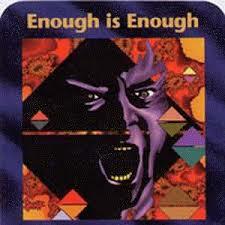 Does Mysterious NWO Illuminati Card Hint At Upcoming Political Assassination Attempt? Have They Had Enough? 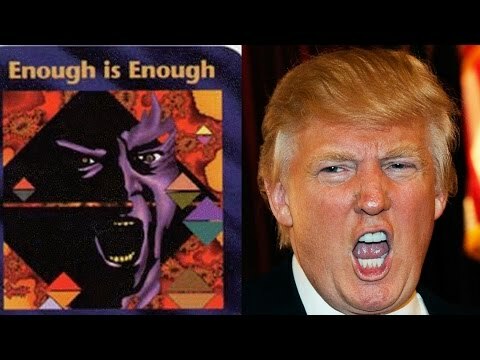 ELECTION NIGHT VIRAL: Does Mysterious NWO Illuminati Card Hint At Upcoming Political Assassination Attempt - Have They Had Enough? Quote on illuminati card game card seen above: "At any time, at any place, our snipers can drop you. Have a nice day." 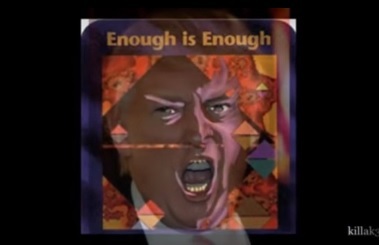 Astute observers have taken an interest in the mysterious illuminati card game card seen above that is called 'enough is enough' and shows the likeness of a man with a bullet whizzing by his head. Is that supposed to be a particular person seen in the illuminati card game card above? When I first showed it to Susan, with her having no idea what or who it was, she immediately thought one name. Many others have thought the same person. Who do you think this card pictures? Who does this illuminati card game card show? Do you REALLY see anyone at all in that? Of course, that's Hitlery Clinton! If you said Donald Trump, you're not alone and after recent threats allegedly made by Mexican drug lord El Chapo, who is allegedly offering $100 million dollars for the capture of Trump "dead or alive", this illuminati card game card is being looked at suspicously. Especially considering recent political rhetoric dished out by several of Trump's political rivals including Hillary Clinton, Jeb Bush and NJ Governor Chris Christie as seen in the 1st video below - "ENOUGH!" they shout, almost as if in unison, in reference to Donald's 'antics'. With even the CIA recently admitting that they themselves were part of the cover-up of the JFK assassination as shared in this new story from Politico, 'accidentally' legitimizing the JFK conspiracy theories, does this card foreshadow another illuminati assassination attempt on US soil? It appears in the card that the bullet misses its' target - we should all pray for the safety of Donald Trump and are grateful that he appears to have a staff of very well trained people protecting him. The "acceptable" political rules have been thrown aside, discussions about important issues such as illegal immigration and amnesty for criminals, are being had all across America, and one man is in the center of the firestorm because of his refusal to "play the game" according to the unspoken rules that career politicians all follow. Donald Trump is in no way a conservative dream candidate, as Think Progress shows there is a "strong progressive case for Donald Trump," yet his rise in the polls show that voters crave what he offers.... straight talk without any thought to political correctness or acceptable "political behavior," nor any intention of toeing any particular party line. Another point that is making political strategists crazy is Trumps refusal to apologize for speaking the truth. Trump is taking the NWO on, he is speaking his mind, he is going against every unwritten "political rule" and yet he is rising in the polls and THAT is why the political establishment from both sides of the aisle, the NWO and the MSM want him gone. Will the illuminazi's attempt to assassinate Donald Trump? We know for a fact that mysterious deaths across America have been happening for many years now and if the illuminati don't get their way, they have no problem with 'star whacking' or political assassinations. Has Trump 'rained on their parade' enough so that they'll soon attempt to 'do away' with him? While some people believe that Trump himself is part of the illuminati clan, a long time huge name who has dabbled in Hollywood and who has been photographed with President's of both parties, we see a Trump who has once again stoked the flames of nationalism and making America great again at a time when the 'nwo' is attempting to put the final nails in America's coffin and completely dissolve all borders to be replaced by their 'North American Union' with world govt having arrived. In the video below we see at first a breakdown of prior 'disasters' that have happened that had their own illuminati card game card PRIOR to the event happening including the Gulf of Mexico oil spill, the Japan tsunami and nuclear disaster and 9/11. Is Trump being targetted by the 'illuminazis' for almost single handedly demolishing their plans for a 'new world order'? Watch as Clinton, Christie and has-been ex-Florida Governor Jeb Bush warn Donald Trump... "ENOUGH!" Play this card on your own turn, before drawing any Plots. You may remove all Zap, Paralysis or Attribute Freeze cards that are affecting your Power Structure. However, preoccupied with your house-cleaning, you may draw no Plots this turn.